I’m so glad you’re here! I’ve got just a little bit more to go through, so this shouldn’t be too long. Work, work, work….you ever think of work as though it was a game of Duck Hunt? I never have, but I thought it would be a funny way to talk about goals. You see, I’ve heard from a very reliable source that making goals is a great way to form a future…I hope that doesn’t sound condescending. Because when you think about it, when was the last time you actually sat down and wrote your goals…I know I’ve only done it when a teacher has instructed me to do so. I’m not sure why I haven’t done it otherwise because I always feel so empowered afterwards. So, I now take on the task of writing prescribed goal types for the sake of a grade and, of course, a future. Publish my already drawn, 24 page comic. Have at least two children’s books illustrated. Meet/get in contact with at least 5 people who talk cartoon business. Here goes some more goals, but we’re going to change it up! My teach was talking about these and it got me to thinking…I’m not really sure I have any of these, excluding regular “life” goals, except to continue what I’m working towards now. However, I realize that there could be a lot of good in trying to cook up some. So, let’s give it a shot, shall we! Write an article including an interview with John Williams (or any old by-hand animator…he’s just my loftiest aspiration). Curate a show that highlights George Herriman’s career (again, a little lofty…better leave wiggle room and make it any artist. Doug TenNapel may be a great one, as well. I really love him.). Teach some form of free cartooning class at a Rec Center. There you have it folks. Some long term goals. Not too shabby, if I do say so myself…and apparently I do because it made it to my blog. To end this post I want to leave you with a clip from one of my favorite movies, for several reasons. It’s an uplifting animation about a cat who just can’t be brought down, Cats Don’t Dance. Randy Newman was a part of the creative process behind the music…WHICH IS AMAZING (the music that is)!!!!! The animation is solid gold. THE DANCING WAS CHOREOGRAPHER BY GENE KELLY, for whom the film is dedicated to. It will knock your socks off. 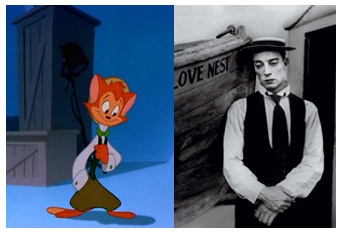 Also, Danny the Cat dresses like Buster Keaton!